I’ll never climb Mount Everest. I have come to accept that. So I did the next best thing – I joined the Swissotel Vertical Marathon at Swissotel The Stamford along with 2,163 others yesterday. I’m not saying that completing the Swissotel Vertical Marathon, which celebrated its 25th anniversary last year, is anything like scaling the world’s highest peak, but it’s probably the closest a 47-year-old slacker like me is going to get. 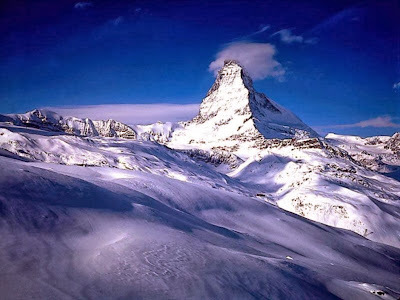 For one thing, Mount Everest is 8,848m high while Swissotel The Stamford is only 226m tall. On the other hand, Mount Everest doesn’t have a Ya Kun Kaya Toast in the basement (I assume). 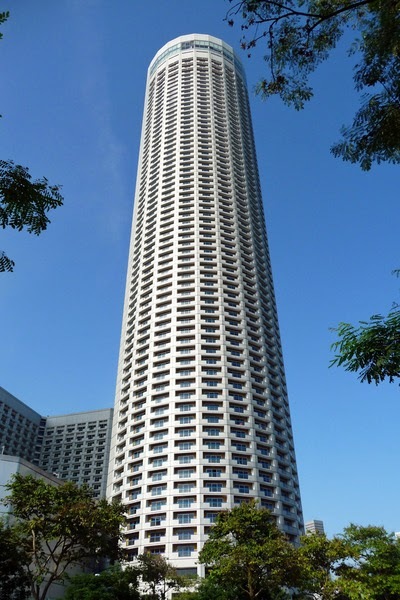 So if you really want to simulate climbing Mount Everest, you would need to climb Swissotel The Stamford’s 73 storeys 39.15 times and go without kaya toast. I’m sure the three members of Team Singapura Everest 2015 who took part in the vertical marathon were aware of this. 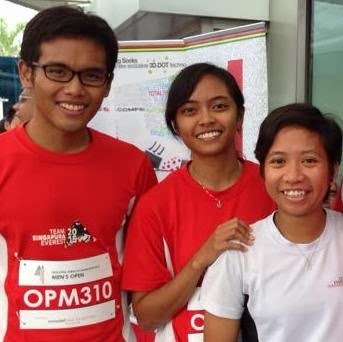 Unlike me, two of them — Mr Muhd Hilwan, 27, and Ms Nur Yusrina Yaakob, 26 – are actually planning to climb Mount Everest in 2015 to celebrate Singapore’s 50th birthday. But I saw them climb the 73 storeys at Swissotel The Stamford only once. I don’t know if they had any kaya toast. 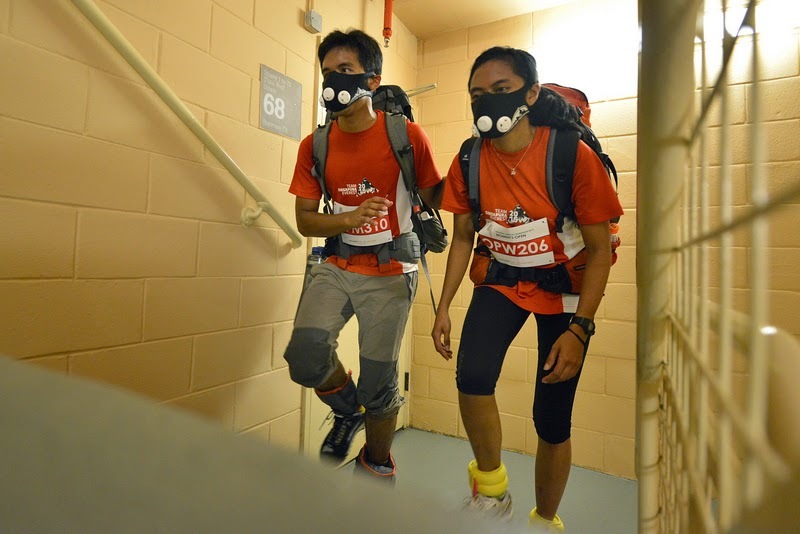 They told me that as part of their Everest training, they climb the stairs of a 40-storey HDB block in Toa Payoh a few times a week. Similarly, I had trained for the vertical marathon by climbing the stairs of my 16-storey HDB block in Choa Chu Kang a few times a week. Because of recent news reports, I was wary of chancing upon amorous couples at the staircase landings... uh, let’s say, enjoying a private moment. So I was careful to make as much noise as I could with loud breathing and heavy footsteps to warn any mid-coitus lovers that I was approaching. Once, I heard some scrambling on a floor above me, but when I reached there, I didn’t see anyone, which was a relief. Fortunately, nothing like that happened to me in the Swissotel The Stamford stairway yesterday. 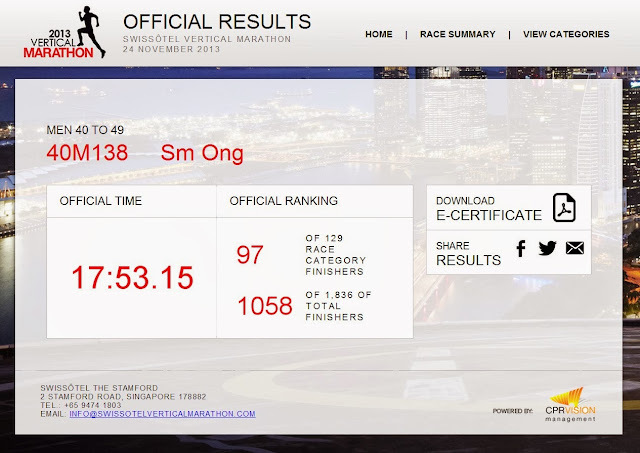 Although it was my first Swissotel Vertical Marathon, it was not my first vertical marathon. In June, I had survived the 40-storey National Vertical Marathon at Asia Square (near Lau Pa Sat), where I learnt a few things. 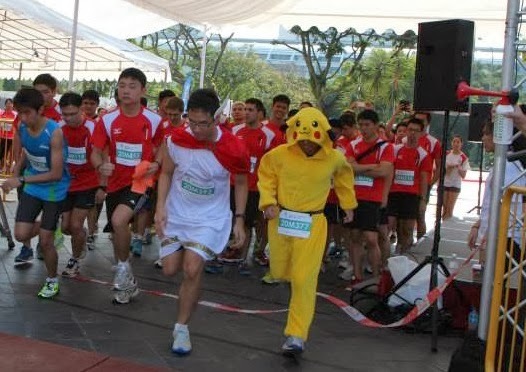 One is, just because other runners are sprinting up the stairs at the start doesn’t mean you have to keep up with them. You’re going to conk out before you reach the 10th storey. You have to climb at your own pace, but the “peer pressure” can be hard to resist. My biggest dilemma was whether I should climb two steps at a time or one. If I climbed two steps at a time from the start, I would tire quickly. But if I climbed one step at a time, I could still be in the Swissotel The Stamford stairway as you’re reading this. Then yesterday, a miracle happened. While waiting in the holding area outside the hotel before the race, I noticed a guy with one leg and crutches. He was wearing the same colour race bib as I was, which meant he and I were running in the same category. I decided I was going to run next to him. No peer pressure there. For the first few floors, I was right behind him. 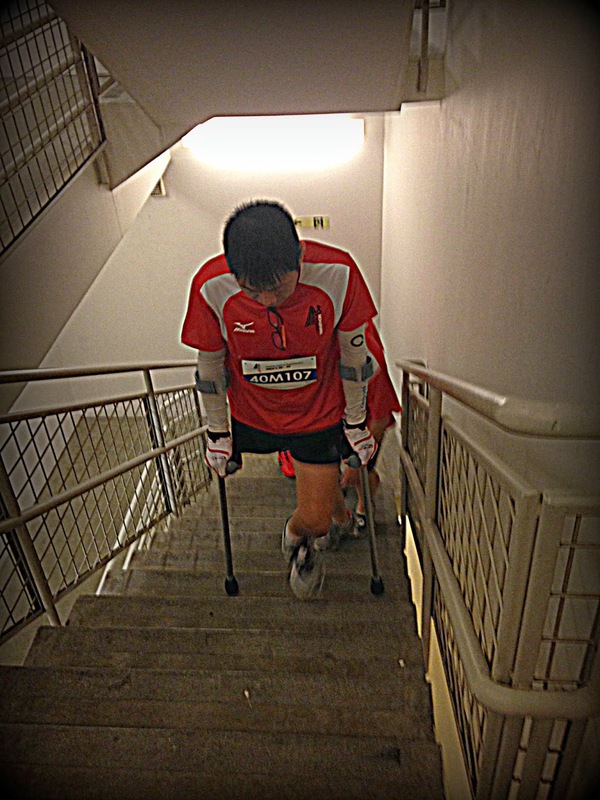 Since he was on crutches, he could climb only one step at a time. So I, too, climbed one step at a time. It was a breeze. I eventually overtook the one-legged guy, occasionally climbing two steps at a time like the hero that I am, and finished the vertical marathon way, way, way ahead of him. I beat the man with one leg! I later found out his name is Mr Ezzy Wang Peng Han. The 47-year-old lost his right limb after his pelvis was attacked by a rare form of bone cancer in 1996. But he won’t be defeated. Just like he wouldn’t be defeated by the likes of me. At the finish line on the rooftop of Singapore’s tallest hotel, I asked Mr Wang how he kept going, knowing he could never catch up with me. Yeah, but I reached the pinnacle before he did. That felt almost as good as if I had climbed Everest. To celebrate, I’m going to order some kaya toast. It was a day of heroes – masked and otherwise. 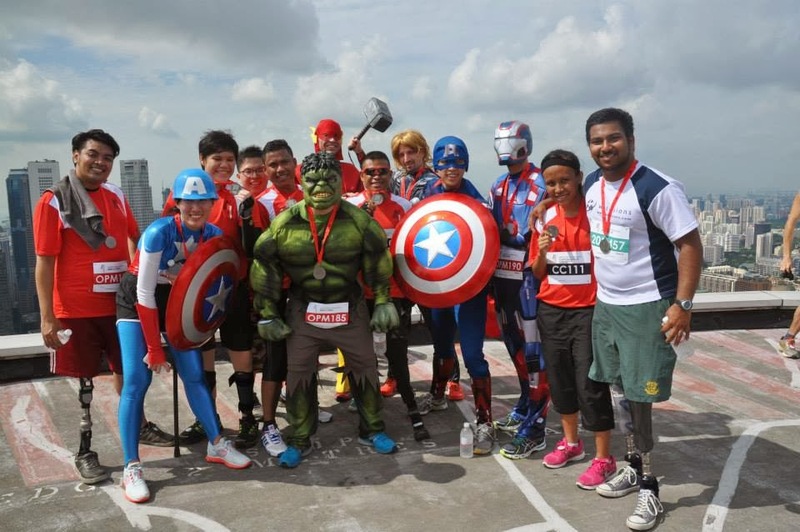 The big crowd favourites at yesterday’s Swissotel Vertical Marathon were the “Avengers”, who won the Most Creatively Dressed prize — all 10 of them. Captain America, Thor, the Hulk, Black Widow, Iron Man, Iron Patriot, Spider-Man, a female Captain America, the Flash and Elastigirl from The Incredibles. You may argue that the Flash is not only not an Avenger, he’s not even from the Marvel universe, and Elastigirl is from a whole different genre altogether, but you’re going to want to take pictures with them anyway. I felt sorry for the person dressed as Pikachu who didn’t win. 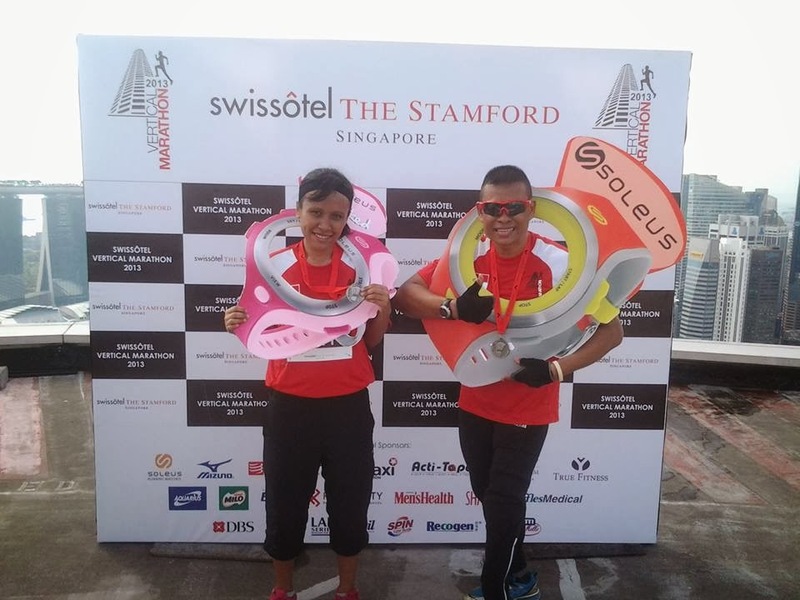 Also climbing the stairs in a “costume” of sorts were Mr Muhd Hilwan and Ms Nur Yusrina Yaakob of Team Singapura Everest 2015, who donned some of their training gear for the marathon. The biggest challenge for them was dealing with the lack of ventilation in the stairway with their breathing masks on. 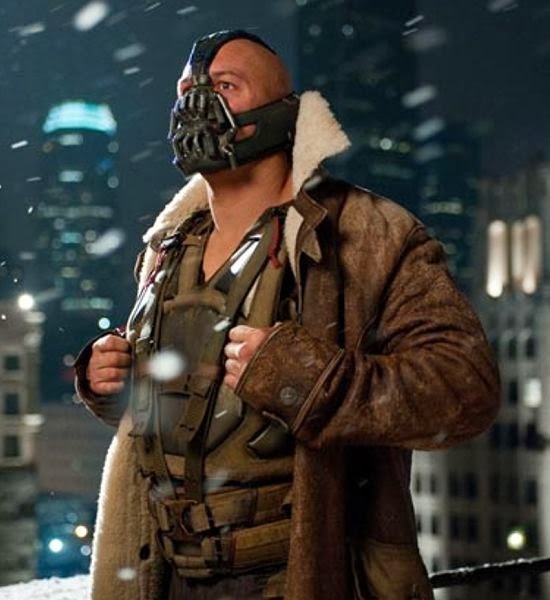 They should get advice from Bane. 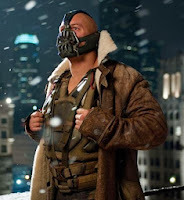 Too bad he didn’t show up with the Avengers yesterday. 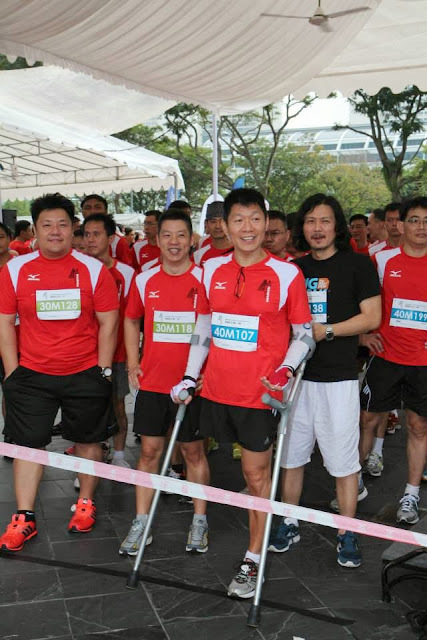 But Singapore’s Blade Runner Md Shariff Abdullah did show up. Mr Shariff, 45, was born without a left foot below the knee. In 2008, part of the same leg was amputated. He had founded Team Singapura Everest 2015 in 2010 to fulfill his dream of conquering Mount Everest, but later left the team. He now hopes to run the Everest Marathon instead. For Mr Shariff, the hero of the day was his daughter Nur ‘Atiqah, 20, who ran the vertical marathon with him and unexpectedly ran ahead of him. Still, even Mr Shariff couldn’t help but take pictures with the Avengers at the finish line.